Exercise time: The group discussion time should be around 10 minutes, plus additional time for an overall class discussion. In his book “The End of Marketing as We Know It”, Sergio Zyman highlights an aggressive marketing campaign that he instigated against Pepsi-Cola with they introduced Crystal Pepsi. Crystal Pepsi was Pepsi without the coloring, so it looks like lemonade. “Crystal-pepsi” by Source. Licensed under Fair use via Wikipedia. When Pepsi introduced Crystal Pepsi their intention was to capture a larger market share of the soft drink market, by having a Pepsi product that competed in the lemon-lime category primarily against 7-Up and Sprite – even though it was a cola drink. Sergio, at Coca-Cola, decided that they would go out of their way to neutralize the impact of the newly launched Pepsi product. One of Coca-Cola’s successful products at the time was Tab. Tab was Coca-Cola’s first diet cola drink, around 20 years before Diet Coke was introduced. To combat Crystal Pepsi, a product line extension of Tab Clear was introduced to compete directly against Crystal Pepsi. The key difference between the two products was that Tab was a diet drink, competing against a full sugar clear version of Pepsi. 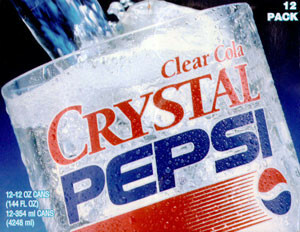 Coca-Cola’s intent, which was highly successful, was to confuse the market as to the positioning (that is, the unique benefits) of both Crystal Pepsi and Tab Clear. With this to say, Crystal Pepsi did not generate significant market share and was eventually withdrawn from the market, along with Tab Clear. According to Sergio’s marketing book, the intent was always to withdraw Tab Clear as the product was simply a competitive defensive move without any long-term intention to maintain the product. Do you agree with the strategy of launching a short-term product in order to simply block a competitive move? Why, why not? To what extent should the cost of development and launch of a new product be considered in this type of situation? In other words, do you think there would be a bottom-line marketing return (ROI) on such a competitive strategy? Should a marketer pursue market share goals (as seems to be the case above) or bottom-line profit goals? How could this trade-off – that is, protecting market share will protect long-term profitability – be effectively implemented into a firm’s hierarchy of marketing goals?